The Vitamin Shoppe sent me a package of variety of their products to help me with my goals to live a happy and healthy life. Cause Vitamins and Minerals are kind of a big thing. This is a sponsored conversation written by me on behalf of the Vitamin Shoppe. The opinions and text are all mine. One of the goals that I set for myself in the New Year was to ensure that I ate a minimum of 4 cups of vegetables each day. I know that is a lot, though once I started to do it day in and day out, it was easy. You see, in the past I thought I was eating enough vegetables, but after I started recording my diet I realized I was falling short some days. It happens to all of us, those days when we rush from one thing to the next, not having time to sit down and eat a healthy meal. So to ensure that I am getting the vitamins and minerals that I need, I am steaming up large batches of vegetables on Sunday to enjoy throughout the week, and I am taking vitamin and mineral supplements every day. 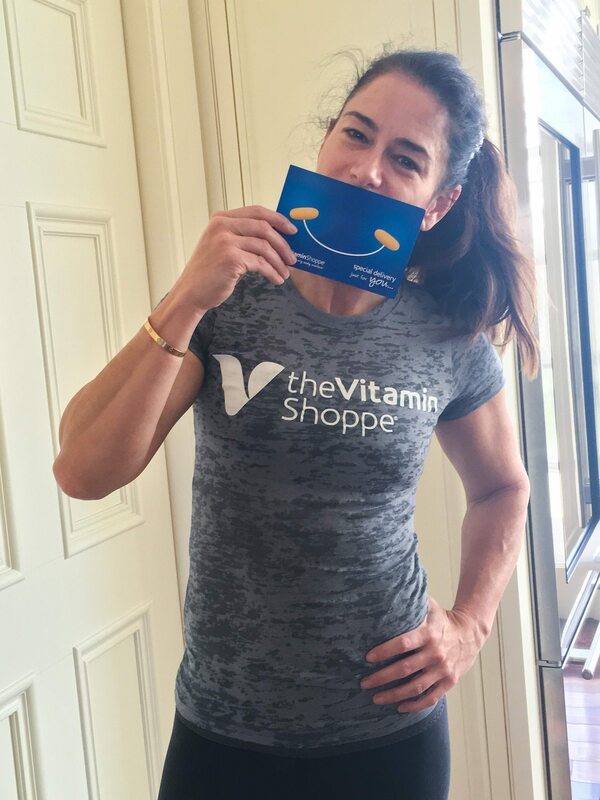 I was thrilled to be asked by Vitamin Shoppe and FitFluential to help spread the word about their campaign #GETYOURGOALON. Helping to highlight how we can all set goals to live a healthier happier life. Let’s face it, every time you turn around someone is telling you that you need to be taking a new vitamin, or eating the newest food. It can be overwhelming, expensive and confusing to try to keep up with all the trends. We are all different in our diets and our health needs, so a one size all vitamins may not work. Diet, lifestyle, environment all play a role in determining what you may or may not want to take. I think it is safe to say that we all know a multivitamin according to package directions is a good place to start. I wanted to share a few supplements that I have added to my daily regiment that you might want to consider. All of these are helping me to achieve my goals and I hope a few will help you too. 1. I changed from fish oil to Krill Oil. Krill oil is a great source of Omega3’s. Which are essential nutrients that help support your mind, heart and bones. 2. Probiotic is a microorganism or live bacteria that lives in your digestive system. They are the good kind of bacteria that helps with digestion and fighting off the bad bacteria. 3. B12 is my little energy booster. It is my favorite supplement, yes I know it is weird, I do have a favorite. B12 works to help make red blood cells, to calm us and maintain our nervous system. There have recently been several studies suggesting that it helps with memory loss. 4. Vitamin C is a powerful antioxidant that helps our bodies to form and maintain connective tissue. Helping to lower stress chemicals that are secreted by the adrenal glands. 5. Magnesium is a mineral that is required for proper function of the nervous, muscular and cardiovascular systems. It helps our bodies to produce energy from the foods that we eat. Allowing our muscles to contract and relax, and key hormones to function properly. Using a supplement as therapy should be done only with a doctor’s guidance. My husband uses fish oil but I will definitely mention the krill oil instead! I know my b12 is really bad and should get around to buying some like I used to. Thanks for all the great tips! Thanks Kacey! I think you meant B12 is good.. I really feel a difference when I take it. Looks like a great selection of vitamins! I use probiotics as a supplement and they help me a lot. Thanks Sheena! Probiotics are great! Thanks Jessica! Gotta keep it fun! Thanks for sharing this great information! Maintaining healthy goals can be intimidating, but these tips are awesome! I agree Serene, there are so many choices and people telling us we need to take this take that. I hope the graphic helps you make a decision about what you need. I love the idea between #GetYourGoalOn – and you’ve provided so much great information and inspiration! One of the things that specifically spoke to me was your observation that sometimes, until we really record what we’re eating, we have the illusion that we’re getting enough servings (of … say … veggies), when we’re actually falling a bit short. That’s such a great point and so very true! Thank you Shelley. I think so many of us, think we are getting what we need through our food, but fall short more than we know. Hope you check out the vitamin shoppe, they are very helpful there with making sure we get the supplements we need.